Mum and cub - the mother will shortly leave her cub to enjoy the catch (see images below). My friends have two nicknames for me (two that I know about, at least). The first is ‘Beethoven’, which is not due to the way in which I dribble when someone opens a tin of Pedigree Chum, but due to my love of the composer’s music (I wrote my PhD dissertation on Beethoven and have devoted much of my life to performing and giving lectures on his music). The other nickname is ‘otter’. I’ve probably devoted more hours to photographing otters (and most of that has been spent waiting patiently to catch a glimpse of one) than to any other single creature. 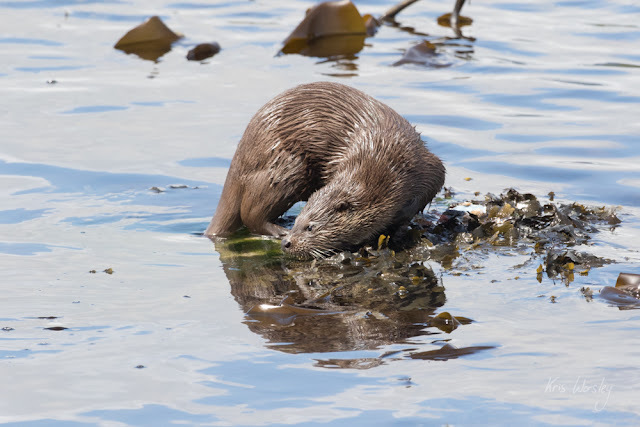 My friends even say I dance like an otter, although having never seen one dance, I couldn’t possible comment, and my wife says she first felt attracted to me when I first started giving her a loch-side lecture on otter behaviour (she’s a keeper, that one). It takes a long time to learn the basics of otter photography. For me, it took two failed trips to the Isle of Mull, where I sat by the shoreline every day for up to 14 hours a day, for weeks at a time, and spent my bedtime reading sessions steeped in books and research papers about otters, trying to work out how on earth I could share their coastline and get within just a few feet of them, close enough to take photographs, without disturbing them. Otters are very sensitive creatures, and you have to be completely in tune with every movement in their environment to close enough. However, the biggest secret is that you have to make sure that you’re in the right position for them to come close to you – you can’t approach an otter. Learning about their behaviour is a never-ending and fascinating learning curve, but I have one simple technique which serves as the basis to this, as it does to all my photography. When I’m ready to go, I calm myself by taking deep breaths of cold Scottish air through my nose – coincidentally this is the same principle that serves as the basis for Buddhist meditation, and I find it really sharpens my senses, making me very sensitive all the sights, sounds and smells around me, so that I can move with nature, not against it. This is also the core principle of Daoist philosophy, feeling nature around you and moving with it, not stirring it in anyway. I know when I’m in the right frame of mind - I can feel the roughness of the stones as they turn and bulge into the soles of my boots as I walk. The line between moving with nature and taking a chance against her is clearer than ever, and it’s important that I can stay securely on the right side of that line. Working this way is much better than going for the fast buck of chasing the shot; instead, it can be possible to follow an otter for many hours at a time (my longest otter stalk to date is about 6 hours, which ended with the otter exiting the loch via a freshwater stream, and scurrying away to its holt – being sure that you’ve followed an otter to its final point of rest for the day is the greatest compliment to your field craft). 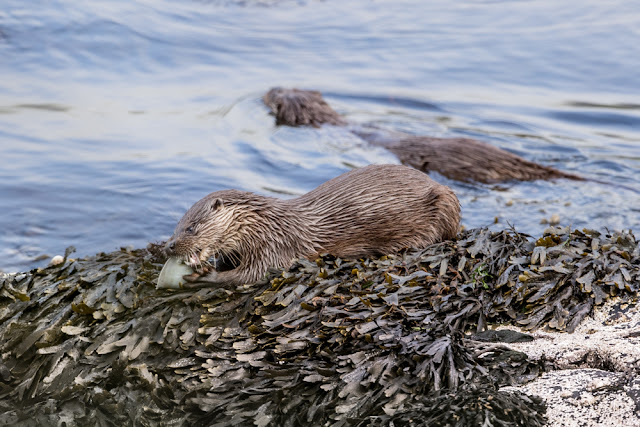 On my recent trip back to Mull, I managed to fit in just one afternoon of otter photography, which is far from ideal since you can never be certain of seeing an otter in that time (particular since I was out of touch with the news of the local otter populations and families). Nevertheless, experience did mean I was able to take some pictures and make sure I had something slightly different to those pictures I’ve taken previously. I used a site which I’ve not visited for years, out of the way from the tourist traps. Privacy from other tourists is important – even the wildlife tour buses stop when they see a photographer with a long lens, and they’re particularly good at scaring away the subject that has taken you hours to track down and get close to. 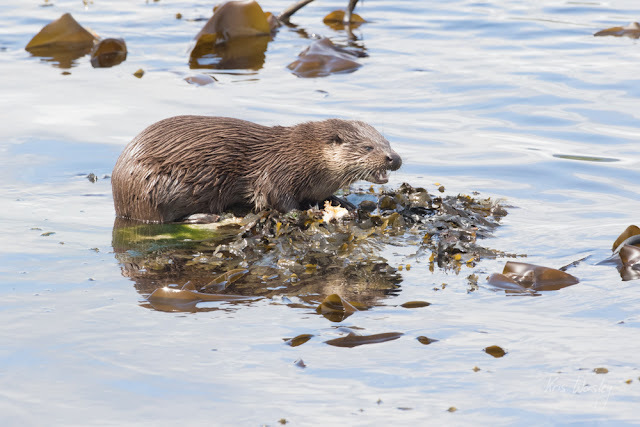 The downside of this site is that the coastline here is rugged and difficult to negotiate on foot, and keeping up with an otter as it goes about its daily business is extremely difficult. So off I set. After a few hours of walking, I find a mother otter and her cub fishing out in the water, and I wait to see if they’ll come into the shore. The cub is quite mature and can fish quite efficiently for itself, and when in the water the two are quite difficult to tell apart. 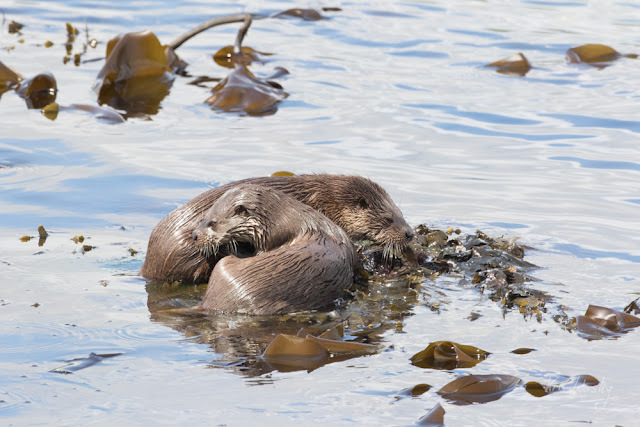 It’s clear, however, that it still needs a little help with the larger meals, and whenever the mum catches a large fish or a crab, she sticks it on top of an exposed rock and then swims back out into the loch, leaving her cub there to tuck in and enjoy it. The mother swims out, leaving her cub to enjoy her catch. After an hour or so on the move, I’ve managed to move up the coast ahead of the otters, hiding myself behind a rock just above the shore. 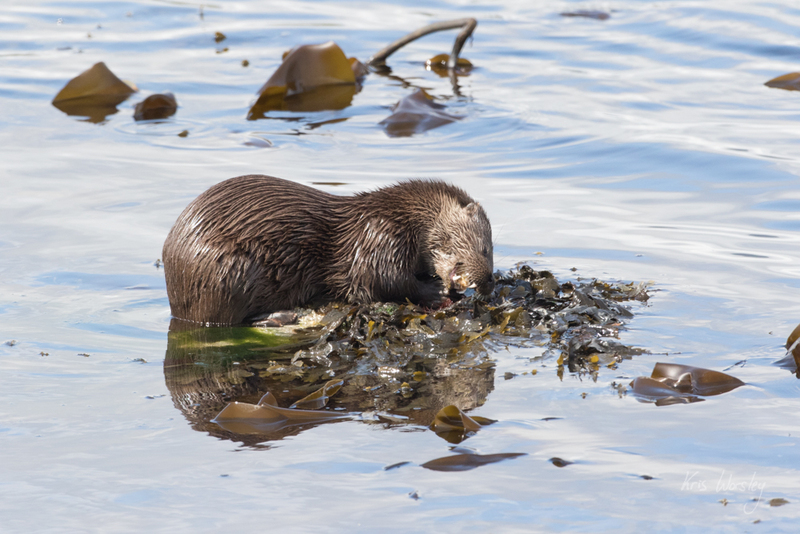 The otters are still working their way round the coast towards me slowly, but there’s no way I’ll get closer to the water than this without being spotted. 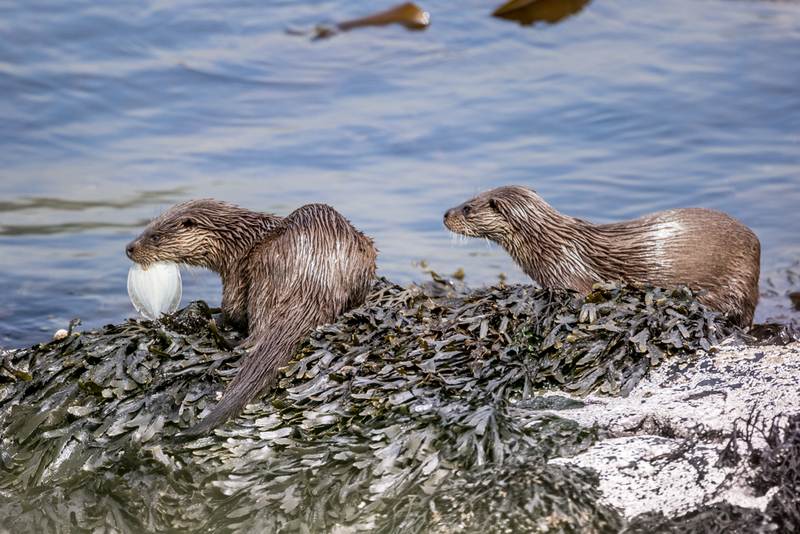 Usually I would hope to get my camera down on the ground, level of with sight-line of the otters, although on this exposed, rough coast, I’m having to keep a slightly higher position, with my camera supported on top of the enormous boulder that I’m using for cover. Eventually the mother brings in a crab and leaves on a pile of seaweed for her cub – I’ve judged my position (and theirs) just right and they’re now just below me. Brilliant. The wind is blowing in my face, which will help take my scent away from the otters, and will slightly dampen the sound of my camera. Even still, I have to be selective in the number of pictures I take since I can hear every single wet munch of the chewing otter just a few metres in front of me – I’m close, very close, and I’m not going to take any chances of disturbing them. This is such a thrill – we’re breathing the same air; our senses are sharpened to the same splashes of water and gusts of breeze around us both. I can hear my own heart beating; I can feel the adrenaline coursing through my blood, and my finger is shaking on the shutter button. The sun comes out, and the water turns into a marvellous marble of blues as it reflects the clear sky. I can take advantage of my high position to make this wonderfully textured surface part of the image. I take a deep breath of that cool, salty Scottish air, in through my nose to help me stay sharp and focused. 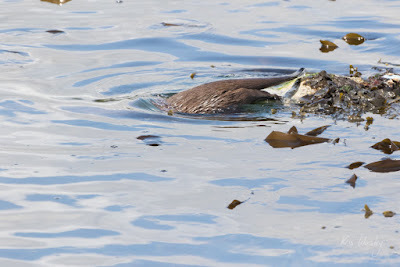 The otter finishes off the crab, looks around and plunges into the water again to join its mother. They work their way up the coast a little further, but I need to stay in position for a few minutes if I’m going to leave the scene undetected. I wait and leave them to it for the rest of the day. The high position helped me to photograph the marbled blue water when the sun came out. The sun also gave the otter cub a nice catch-light in the eye, which enlivens the picture.